Scientists have taken a step towards the goal of regenerating damaged tendons with the discovery that embryonic stem cells (ESCs) can produce “artificial tendon” in the presence of inflammation. Researchers at the Animal Health Trust (AHT) in Newmarket studied the ability of three different populations of equine tendon cells (tenocytes) to produce “artificial tendon” in tissue culture. They grew tenocytes derived from ESCs, foetal tendon and adult tendon, and studied the effect of inflammatory markers on the process. 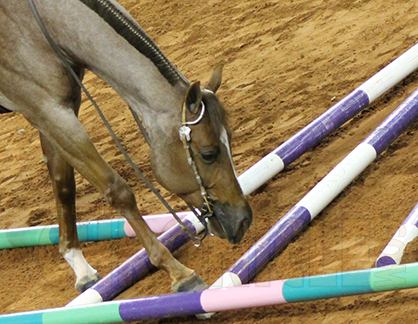 The superficial digital flexor tendon is the most frequently injured tendon in the horse. With conventional treatment, a damaged tendon will heal with fibrous tissue impairing its elasticity. This results in reduced performance and a substantial risk of re-injury. Regenerative medicine aims to replace the damaged tissue with tendon fibres that are as near normal as possible. This has led to the use of stem cells, which have the potential to differentiate into different cell types. Stem cells can be implanted into the damaged tendon with the intention that they will differentiate into tenocytes and produce replacement tendon fibres. However, the inflammatory environment that exists in the healing tendon – mediated by signaling molecules (cytokines) such as interleukin-1β (IL-1β) – may interfere with the stem cells’ growth. The work at the AHT shows that the surface receptors of ESC-derived tenocytes differ from those of tenocytes derived from foetal or adult tendon. This makes them less responsive to IL-1β and so less affected by inflammation. They found that adult and foetal tenocytes, when cultured in collagen gel in the presence of IL-1β produced artificial tendon that was less elastic than normal. In contrast ESC-derived tenocytes were not affected by IL-1β. The research team are now looking to further studies to understand how the ESC-derived tenocytes protect themselves from inflammation. This may allow them to develop drug treatments that could limit the damage to tendon cells after an injury.